Since 2018, Swedish students have been striking in front of the Parliament in Stockholm every Friday, prompted initially by high school student Greta Thunberg. The demand has been simple – the Swedish government should meet the carbon emissions reduction targets set out in the Paris Agreement. The movement has continued to grow, and on March 15 students from around the world walked out of classes in a strike for climate justice. In Canada, the first climate walkout occurred in Sudbury in November last year when Sophia Mathur joined the #FridaysfortheFuture actions, with students in nine cities walking out. In all parts of Canada on March 15, high school students, often joined by university students, joined the climate strike. 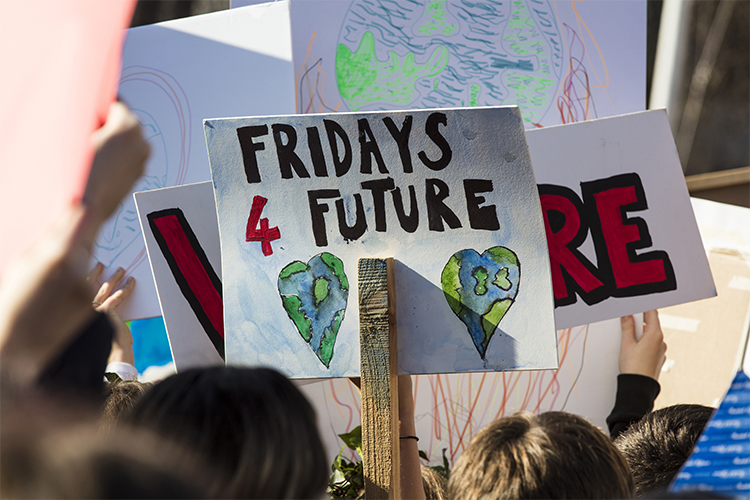 The student climate strikes continue to grow in Canada and around the world, with the next Canada wide walkout planned by Fridays for the Future for May 3, 2019. These need to become mass strikes that we can only hope keep building and, indeed, begin to push beyond students to all sectors of society. The world’s first Global Climate Strike for the Future, that took place on March 15th, is destined to make a profound mark. Something that should make everyone stop and reflect is the fact that it is the teenagers and young people from 80 countries around the world, and students from thousands of cities, who are leading this initiative. Indeed, things look even more dramatic if we look at the data provided by the UN’s sixth Global Environment Outlook report just presented at the climate summit underway in Nairobi. These facts should lead us to think twice because, for the first time in human history, we are close to catastrophic processes which will determine the living conditions of future generations on Earth, and even though we are certain and aware of them, we are failing to act. Instead, we let the governments and political forces organize pompous international meetings, destined to change little or nothing about the mechanisms that are causing the climate to heat up, and we continue living the consumerist lifestyle that is pushing the planet toward destruction. That is why the fact that young people – to whom we are leaving a legacy of impoverished and inhospitable habitats to be fought over by a growing population – are assuming the roles of protagonists with a worldwide protest movement is a heartening development that gives one hope. They are going on “strike,” signaling their disobedience and refusal to work – in this case, a refusal to attend school – something that gives a special character to this event, and at the same time shows the tragic problem with the current global situation. The kids are the ones going on strike, and in effect striking against their own interests, losing hours of their studies. Yet everyone else is not striking: the adults, factory workers, employees, executives, all the figures who would actually be able to do serious economic damage to the extractive capitalists responsible. It should have been us, the adults – who have been enjoying, and still enjoy, the comfort made possible by the destruction of the Earth – to rebel and organize a general strike to stop the infernal machine that throws 1.3 billion tons of food per year straight into landfills, dumps the excrement from 24 billion farm animals into the waters, fills the air with CO2 and other greenhouse gases, floods urban areas with millions more cars than they can support, and is heaping up mountains of technological waste (e-waste) around the world – whole mountain ranges born out of planned obsolescence. While it’s all too easy to sit and draw conclusions on the occasion of this memorable event, it is important to also call out a warning and an alarm. Young people cannot hope to win the war with one battle, because they cannot afford the delusion that those who are governing the world economic order care even the slightest bit about their future and that of the Earth. They will destroy even the last strip of fertile soil and dry up the waters of the Earth to the last drop, as long as they are able to draw some private profit from it. And there is no argument that will stop them or lead them to take another route, except for hitting them where their vital interests lie. To this end, the protest must take a systematic and structured form, bringing the fight to several fronts. 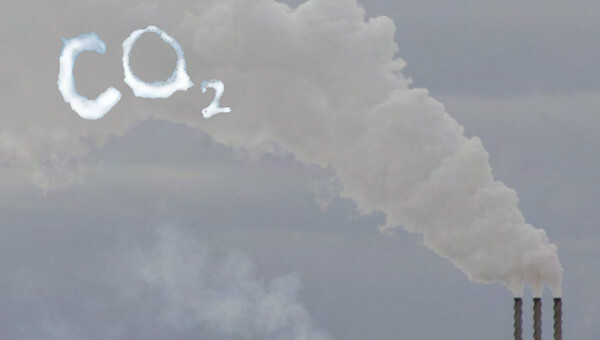 It must put pressure on the governments, involving all the many forces which are now engaged in these struggles, for the ecological re-conversion of the cities (full recycling of waste, the spread of solar power, limiting urban traffic, the reuse of waste water, a stop to the destructive spread of cement, etc.). Furthermore, it must also set up systematic campaigns of boycott against goods produced using systems that are destroying natural habitats. The young people need to be aware that there is no more time, and that the moralistic sermons and the lofty rhetoric of the political class are not going to make the mechanisms in place budge even an inch. It will take weeks and months of a “consumption strike” – boycotting meat from factory farms, the products of industrial agriculture, goods designed to break, the whole American lifestyle imposed by U.S. capitalism on the world – if one wants to succeed in pushing the powers ruling over production, which are currently dominating the planet’s economy, onto a track compatible with the survival of the environment. This article first published on the Il Manifesto website. Fernands has been struggling with that sense of helplessness since she first became keyed into the accelerating timetable of climate change in seventh grade. “It seemed like the end of the world,” she said. “But the apocalyptic message wasn’t being broadcast. Nobody was taking correct action to put us on a path away from climate catastrophe.” Because her parents and teachers didn’t seem to share her urgency, Fernands decided that she herself would have to sound the alarm over climate. 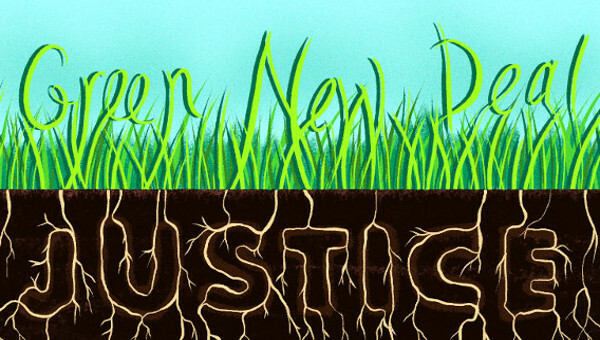 Over the past year, Fernands, now a sophomore in high school, has connected with other young people around the country and the world who grasp how dire the climate crisis is. And today they’ll be taking to the streets in at least 105 countries. 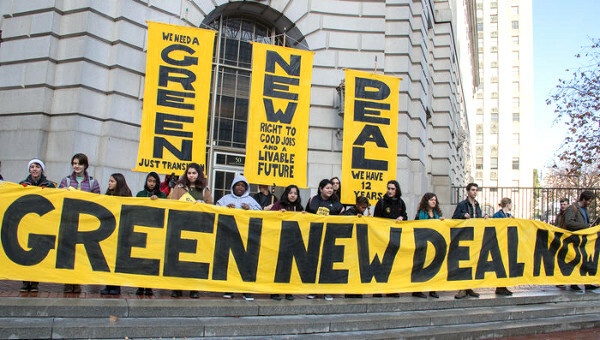 In the U.S., youth will strike in more than 100 cities, taking time off from school to demand radical legislative action to combat climate change and a transition to a 100 per cent renewable economy. As much as it is an effort to make the planet livable in the future, the strike is also, for many young activists, a sanity-saving expression of the grief and anxiety they shoulder about a quickly worsening crisis that older people have been unwilling or unable to fix. She’s not the only one who has found activism to be the cure for climate anxiety. Marcela Mulholland, a senior at the University of Florida, grew up in South Florida and has experienced the ravages of flooding, storms, and rising temperatures firsthand. “I was drawn to this work because of a deep sense of pain,” said Mulholland. Climate change is causing mental anguish in people of all ages, according to Lise Van Susteren, a psychiatrist and member of the Climate Psychiatry Alliance. “When you’re hearing day in and day out that we’ve got 12 years, we’ve got 11 years, the oceans are collapsing, fires are burning, air quality is terrible, wear a mask, the anxiety is inescapable,” said Van Susteren. “It sticks itself into dark crevices in your brain.” For kids, she said, there’s often an added emotional layer of feeling betrayed by the older generation’s inaction. Berfond, who has been terrified about climate change since elementary school, has found relief in sharing some of the anxieties she used to keep to herself with other activists. “Every time the winter is rainy and there’s no snow, I get really upset,” said Berfond. “I talked about that in a Sunrise meeting recently – how I remembered winters being different. And every person around my age said, ‘Oh my god, I feel the same way.’” The discussion eased some of the burden. “Saying ‘I’m scared’ publicly is cathartic,” said Berfond. But there are limits to the uplift. “The reality is that the climate crisis is really depressing,” said Oli Tierney, a 17-year-old climate activist in Louisville, Kentucky. Tierney has found that urging lawmakers to do something about the crisis has eased her feelings of helplessness. But nothing can shake her worry about her mother and grandfather, who both have disabilities and live in a coastal area of the Philippines that has already been hit by storms. Tierney was thinking about her mother and grandfather when she and other young Kentuckians stormed Senate Majority Leader Mitch McConnell’s office last month to demand climate action. She was already facing possible suspension from school for skipping part of a class to attend a planning meeting for the protest. And then security guards told the protesters that if they didn’t leave, they would be arrested. Tierney left – in tears. But girded by her fellow activists and her conviction that someone needs to call attention to the environmental catastrophe the adults around her are ignoring, she spent much of the next few weeks planning Friday’s walkout. This article first published on the The Intercept.com website. The International Trade Union Confederation (ITUC) is standing behind the global student strike, that took place on March 15th – more than 700 actions in 72 countries. Unions in Australia, Belgium, France, Italy, the UK and elsewhere took part and many others are active in mobilizing their members. 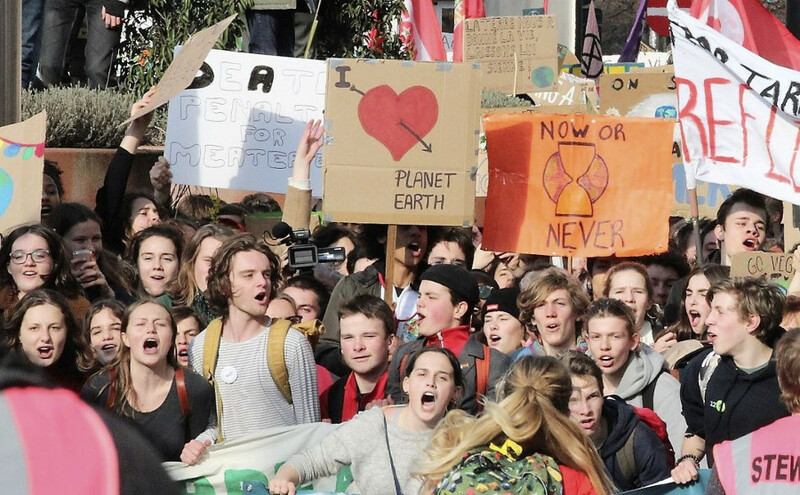 Young people are taking the demand for urgent action on climate to political leaders around the world, proving that the power of democratic voice is alive and well. “The students are taking responsibility where leaders have failed. We have to thank them for their bravery in confronting the climate crisis. Their courage deserves our support,” said Sharan Burrow, ITUC General Secretary. Climate scientists have given the world until 2030 to stabilize the planet with a maximum a 1.5 degree temperature rise. More than 83 million climate refugees are now on record as fleeing from disaster or loss of livelihoods. “Climate change unchecked is the crisis that threatens everyone and will leave whole regions uninhabitable. 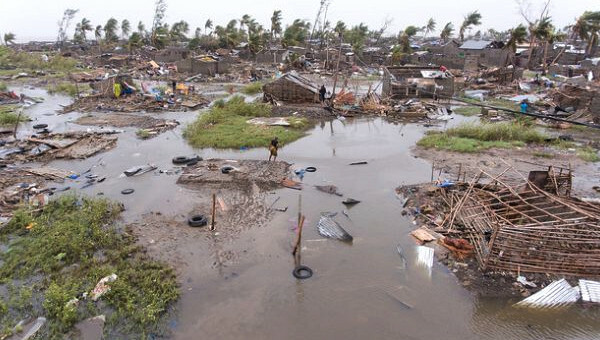 We are already witnessing extreme weather events with destruction and lasting devastation for too many of our people. Governments are not taking responsibility for the high ambition that is vital. “Every Government must raise their ambition and determine national development plans including Just Transition measures to protect workers, their families and their communities. All employers must have a plan for climate proofing their industries and workplaces and Just Transition measures must be at the heart of these plans,” said Burrow. Taking inspiration from young people, union representatives in workplaces will, in the last week of June, invite employers to sit down with the workers in workplaces to discuss plans to reduce emissions and climate proof workplaces. This article first published on the ITUC website.